According to one of Mousavi’s website, around 70 University professors have been detained by the authorities for having contact with him. A mourning ceremony is supposed to take place on Thursday for the victims of the protests. Despite Mousavi’s call for a large rally today, in front of the parliament, only a few thousands protesters were able to make it to the Square. The police used water cannons, tear gas & batons on the crowd. More than 600 people are held in detention, and are making “confessions ” for the benefit of state runs TV & radio’s propaganda. Mousavi, himself wasn’t present at the demonstration. He hasn’t been seen in public for about a week. Mousavi is urging his supporters to gather outside the Iranian Parliament on Wednesday at 4:00PM in Baharestan Square, it is not confirmed if Mousavi will be attending himself. The Iranian government has ordered protesters to stay off the streets. On Tuesday, the Iranian authorities said they would set special courts to crack down on protesters and ” teach them a lesson”. This is according to Al Jazeera. According to his own web site, Mousavi is not under house arrest, depite rumors floating on Twitter. He is however under constant surveillance by security agents & secret police. According to Mousavi’s web site, Twitter has become higly unreliable in recent days. One of the reason is the shut down of a lot of sites, the other one is infiltration from Ahmadinejad’s operatives in an effort to spread rumors or false information. The campaign of Mousavi is asking for the creation of a commission of truth & justice that would be acceptable by all parties, to look into the entire election process. Supreme Leader Ayatollah Khameini has made a compromise, and accepted a request by the Guardian Council to extend the deadline concerning the complains of election irregularities by 5 days. This is a sign that some back room negociations are at play within the Iranian power players. Former president Khatami joined forces with Mousavi and said that they will never accept the election results, and will pursue open civil protest & demonstration until the illitimate government has been removed. 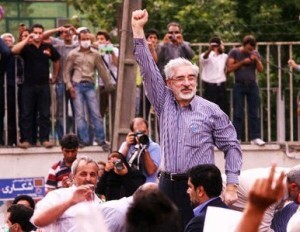 Wednesday will be a big test for Mousavi and his movement. If he can bring some substantial crowd to the demonstration tomorrow, the balance could tilt in his favour.